A 9-year-old girl was presented for evaluation of clitoromegaly (figure 1). There was no evidence of adrenarche, thelarche or accelerated growth. The parents denied a history suggestive of adrenal crisis or progressive hyperpigmentation. On examination, there was clitoral enlargement (3×1 cm), a plexiform neuroma involving right labia majora (figure 1) and surrounding area of right buttock and thigh (figures 1 and 2) and multiple café au lait spots over the body, freckling over her palms (Patrick Yesudian sign) and axilla (Crowe sign) and a sacral dimple with overlying tuft of hair (figure 2). Investigations revealed 46XX karyotype as well as prepubertal luteinizing hormone (0.2 mIU/mL), follicle-stimulating hormone (1.5 mIU/mL) and testosterone (0.3 ng/mL) levels. The 17 hydroxyprogesterone levels (<0.1 ng/mL), cortisol (18.4 µg/dL) and thyroid function tests (T3=154.6 ng/dL, 10.2 µg/dL, thyroid stimulating hormone=5.3 µIU/mL) were normal. The diagnosis of neurofibromatosis (NF) was initially made clinically based on the presence of café au lait spots, plexiform neuroma and axillary freckling. 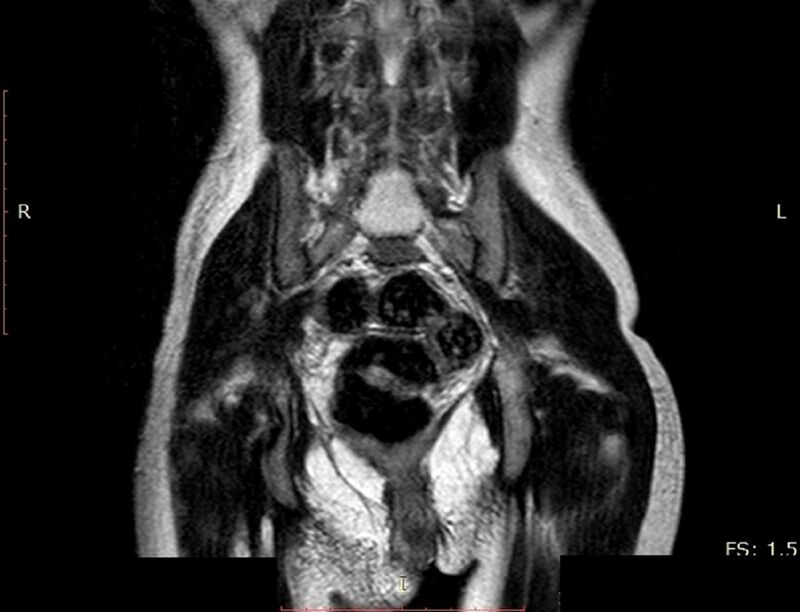 Abdominal and pelvic MRI revealed diffuse thickening of the skin and subcutaneous tissue with altered intensity of right posterior gluteal region with involvement of bilateral labial fold and extension into left gluteal fold and dural ectasia with scalloping of vertebrae further supporting the diagnosis of NF. The adrenal glands were normal and there was no evidence of any other mass lesion (figure 3). Biopsy performed from the right perineal region showed a basket wave stratum corneum, increased basal cell layer melanisation with dermis showing loose delicate wavy collagen with non-encapsulated loose textured tumour extending up to subcutaneous tissue and composed of delicate single fascicle with spindle-shaped nuclei (figure 4), confirming the diagnosis of plexiform neuroma. This is a rare case of pseudoclitoromegaly due to NF involving the genital region. Clitoral enlargement could rarely be the sole presenting feature of genital NF. Clitoral enlargement, café au lait macule and plexiform neuroma involving right buttock. Plexiform neuroma, café au lait macule and sacral dimple. MRI of the abdomen and pelvis showing thickening of skin and subcutaneous tissue of perineal and gluteal region. Histopathology from the right perineal region (A) low power and (B) high power. Clitoral enlargement can be the presenting feature of genital neurofibromatosis. Meticulous clinical examination may prevent unnecessary investigations and treatment for clitoromegaly. Contributors DST and CGY has conceptualised and designed the case report. DST and MP has contributed to acquisition and interpretation of data. DST, CGY and NMB drafted the article. NMB finalised the article by revising and editing it critically.